Maple Banana Pockets are filled with a Maple, Cinnamon Banana filling all wrapped in a flaky puff-pastry pocket – perfect Fall dessert ! 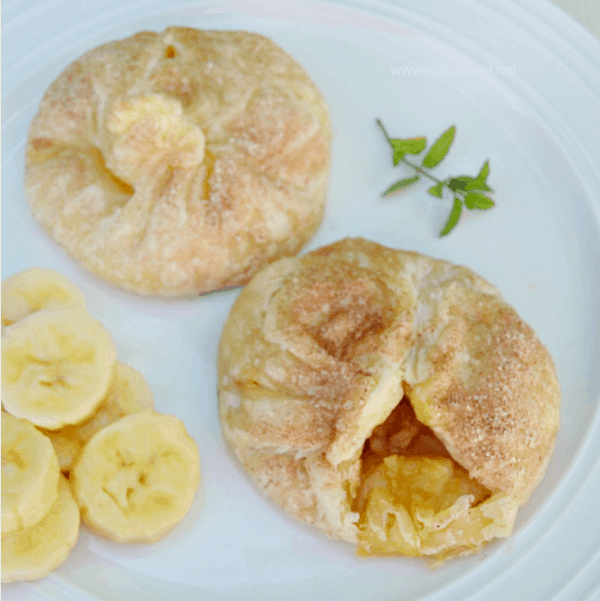 Treat your family to one of these Maple Banana Pockets when you have run out of dessert ideas. Flaky Puff Pastry filled with a delicious Banana filling is such a simple recipe to make, yet it looks and tastes extraordinary. Now and then I would even add some toasted Pecans or Walnuts, chopped coarsely. But my hubby and son are not huge fans of nuts in desserts. I usually keep the last bit of mashed Banana and Maple Syrup for my own Maple Banana Pocket and only then add in the Nuts. Since I do not have a very dependable memory (oh, you too ?! – then read on 😉 ), I either flatten the knotted piece of pastry at the top, or I turn it the other way around. That way the anti-nuts …now, that sounds a little crazy, but you get what I mean, would not end up eating my dessert and the other way around. Do not over fill ! The first time I made these a couple of years ago, I tried to squeeze in as much filling as possible – that did not end too well ! The Maple Banana Pockets, popped open, spilling out most of the filling and it was just a royal mess. I prefer whipped cream with mine, but my family loves ice-cream served with most kinds of warm desserts like this one. I do not mind ice-cream, but I definitely have a preference to whipped cream on the side of just about any dessert (and even some drinks!). These Maple Banana Pockets are extremely quick and easy to make, providing that you remember to defrost the Puff Pastry ahead of time. If Banana is not your thing, try using canned Pears or canned Apples – I recommend canned because it would be easier to mash. Maple Banana Pockets are filled with a Maple, Cinnamon Banana filling all wrapped in a flaky puff-pastry pocket - perfect Fall dessert ! Serve warm with extra Fresh Banana slices, whipped cream or ice-cream. Lovely…i am an "anti nut" too! But walnuts in this seems heavenly! Okay, I am out of puns for the moment. Pinned and shared. found you on Foodie Friends Friday. Cooked banana is wonderfully sweet and almost like pudding. 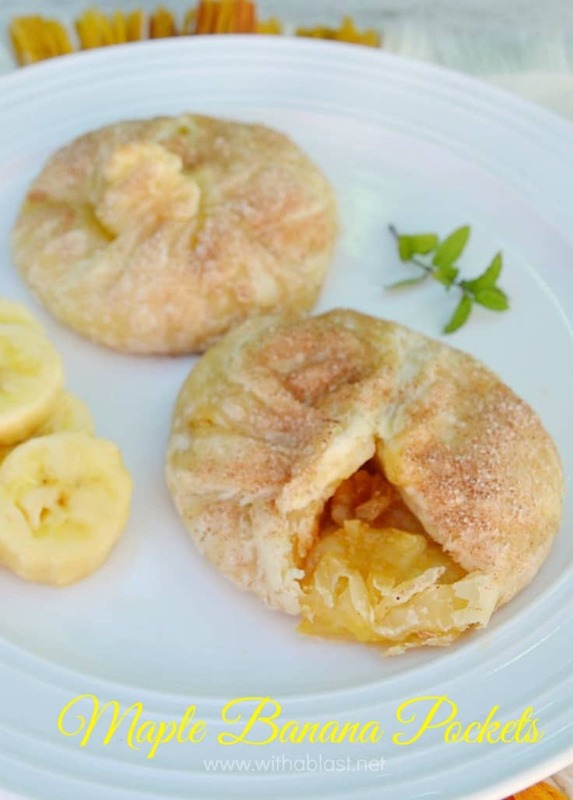 The maple banana combination in these little pastries sounds delicious! These look scrumptious! And I bet they'd be a big hit with my banana-loving toddler! Thanks for sharing! 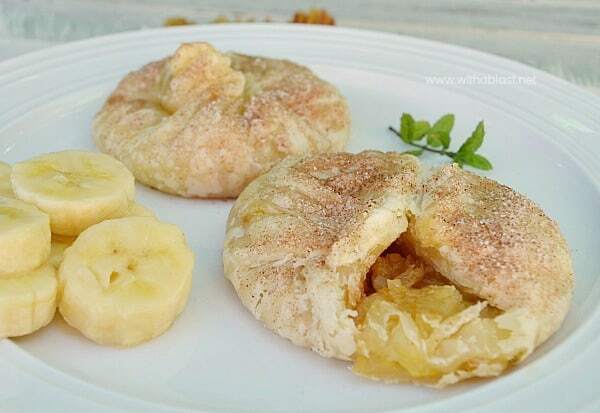 Great way for me to use up soft bananas. Will have to keep this recipe in mind. Ha ha…I know what you mean by the filling explosion. I have had that happen all too often too. I never learn as I squeeze it all in. Thank you so much for attending week 16 of #PureBlogLove and linking your fantastic blog post, I can't wait to see what you have in store for our next party, Thursday 8 PM EST- Sundays at midnight. Your post has been added to the #PureBlogLove Pinterest board for all to see 🙂 Have a great day! These sound amazeballs- you definitely have my mouth watering! Thank you for linking up to Snickerdoodle Sunday- hope to see your latest bakes and makes tomorrow at 5:00 ET!